Cilantro Lime Rice is one of my requirements for a burrito or burrito bowl. If you like your meat spicy like me, then this is required to cut some of the heat. 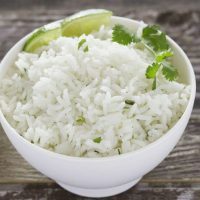 There are probably thousands, if not more, recipes for cilantro lime rice floating around on the internet. But all of them seem to have the same ingredients, rice, citrus juice and cilantro. If you have read this blog from the beginning you probably already know that I cilantro is NOT one of my favorite foods or flavors! GIZMODO published an article that says I may never learn to like Cilantro. I can eat cilantro in small, VERY SMALL doses. Since I make this recipe for myself generally, I do not use much cilantro and have been known to use parsley instead. If you are a cilantro lover, then feel free to add more cilantro. 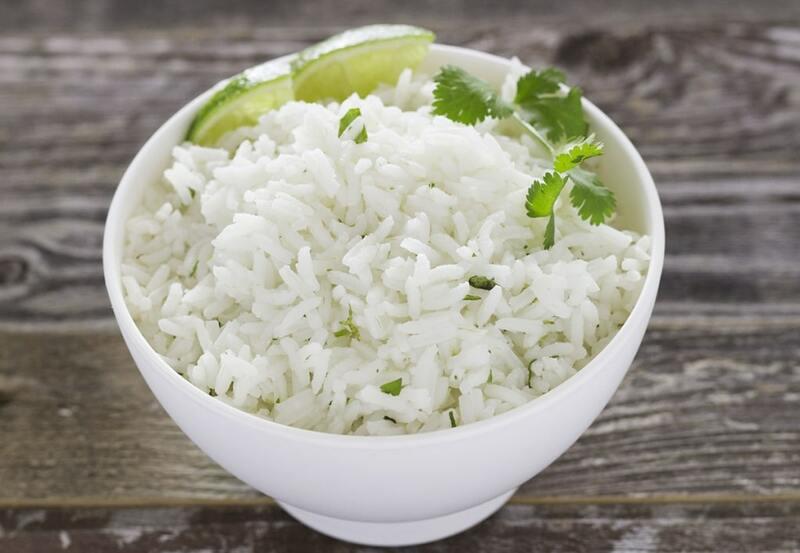 I would just suggest that you taste your rice before adding more citrus juice or cilantro. I use basmati rice usually, but you could easily replace it with long grain rice, jasmine rice, minute rice, and you could probably even try using the boil-in-bag rice. I won’t judge, I have been known to serve rice from those really convenient bags on nights I need to get dinner on the table quickly. Cooking is all about experimenting and finding the flavors that you like. Cooking should never be intimidating! The worst thing that can happen is that you run to the pantry and break out a can of soup or find the best delivery pizza coupon available and order pizza. I keep soup in the pantry for just this situation and I am always aware of the latest pizza delivery deals! No shame here. I like this rice best when I pair it with Slow Cooker Mexican Barbacoa, black beans, pico de gallo, and Corn and Roasted Poblano Salsa in a burrito bowl. 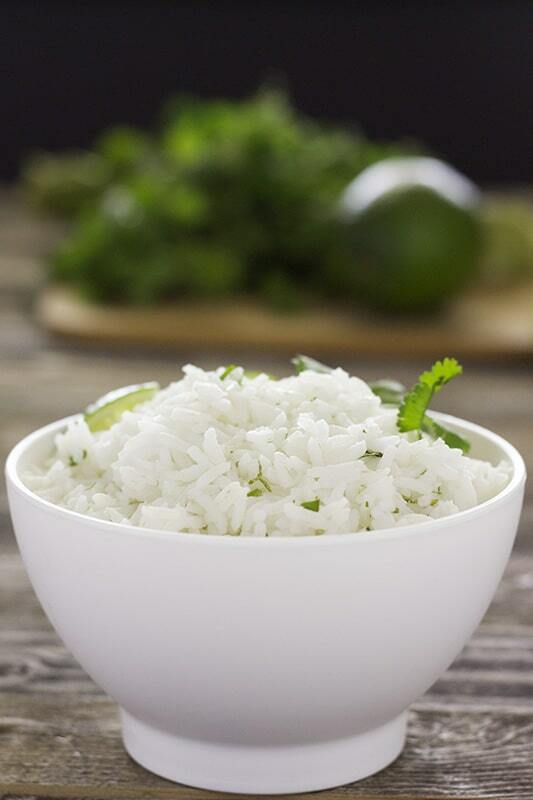 An easy recipe with tips for fluffy Basmati rice flavored with cilantro and citrus. Bring a large pot of water to a boil, you want at least 8 cups of water boiling. Rinse rice for 3 to 4 minutes under running water. Once water is boiling, add rinsed rice and bay leaves. Bring water back to a boil. Reduce heat to medium and keep rice at a low, slow boil for 10 to 12 minutes. Test rice for doneness at the 9 minute mark. If it is completely cooked, go ahead and remove it from the heat, if not continue cooking until rice is tender. Drain rice and rinse with hot water for a few minutes. Dump rinsed rice onto a large baking sheet with sides and spread it out. This will allow it to dry a bit so that the rice does not stick together. Sprinkle cilantro over the hot rice. Allow rice to sit on the pan for about 5 minutes. Place rice into a bowl, add lime zest, lime juice, and lemon juice. Mix well. This lime rice looks so delicious! I’m definitely going to try it this week. Thanks for the recipe! I know you said there are recipes all over the Internet, but honestly I’d never heard of cilantro lime rice before. But then, I’m not in an area known for Mexican cooking or other Latin cooking. I buy frozen cilantro, probably because I’m not a big fan either, but some recipes call for it. They come in a bunch of little frozen cubes and you just pop one out as needed. It seems to me that could thaw out quite nicely once put on top of hot rice. Thanks for the recipe, and just reminded me I used the last of my rice up a couple of days ago and need to put it on the shopping list!